I grew up in Baltimore , MD living on the same street for 26 years, then lived in Bethlehem, PA, Cincinnati, OH and Hedgesville, WV. I currently live in Midlothian, VA, where we moved to be closer to our four grandchildren, two of which arrived in early December from Sierra Leone, Africa after a long four year wait. When I was in Cincinnati I was fortunate to stumble across a job at a needlework shop, Twisted Threads, where I worked as the manager for 9+ years. This was a dream come true where I worked for Ruth Sparrow, owner and designer of Twisted Threads and a part of the Trilogy. The shop closed in 2004 but I miss it and my fellow Twisted Sisters every day!!! I've been stitching for 55 years. My first recollection was of a card table cloth my grandmother gave me around the age of 10. My mother had started it as a child and finished two corners. I undertook the task of finishing the other two corners and was hooked. I sewed mainly in my teens making a lot of my own clothes and took up crewel embroidery and needlepoint after I was married. I tried counted cross stitch when my oldest daughter was born and that is what I've stayed with over the years. I started my blog in January 2012 as a way to connect with other stitchers. When my husband and I moved to WV we started our own business and I worked out of the home and was alone all day. We had no local needlework shop and I never found another stitcher closer than 50 minutes away. This was a great opportunity to reach out and share with other needlewomen. The name of my blog came about because I like bee related things and I thought I'd be musing about my first grandchild. I am an eclectic, random, organized serial starter. Basically I work on what suits me at the time unless I have a gift or class pre-work looming. I love taking classes and always feel I learn something new, albeit a new stitch, joining technique, finishing idea etc. I like a lot of different styles and designers....whatever "calls" to me. I LOVE putting that first stitch in on a virgin piece of linen!!! Smalls are my favorite thing to stitch so my favorite designers are Betsy Morgan, Merry Cox, Sherri Jones and Jackie du Plessis. I am fortunate that I have a venue, Salty Yarns in Ocean City, MD, within a 5 hour drive that hosts a number of these teachers yearly. I am most proud of The Regal Bee. This is a piece designed by Theresa Baird of Heartsease Examplar Workes. I entered it in the Woodlawn Needlework show in 2013 and won a first place blue ribbon in the Blackwork category. The challenge to this piece was the chart came with no finishing instructions, so I had to pull on what I had learned in my classes with various teachers. The second one would be And They Sinned by Examplar Dames. I started this in October 2002, put it aside and finished it in March 2015. I have always wanted to try quilting but know I'd be sucked down the "rabbit hole"!!! I love fabric and have a "collection" of fat quarters I use for finishing but really don't want another craft to distract me from the HUGE stash I have now for cross stitch. I will just enjoy others work in this area. Yes, I hate to admit but I have stitched pieces that haven't been finished ( I jut recently learned about the FFO acronym). As I said earlier, I love to make smalls... boxes, needlebooks, pincushions, scissor fobs etc. They all reside in a display cabinet which I am rapidly outgrowing. Some framed pieces are hung throughout my house permanently and then I have some seasonal pieces I rotate depending on the time of year. Most people would be surprised to learn I have a tattoo! It's a small shamrock on my right shoulder. 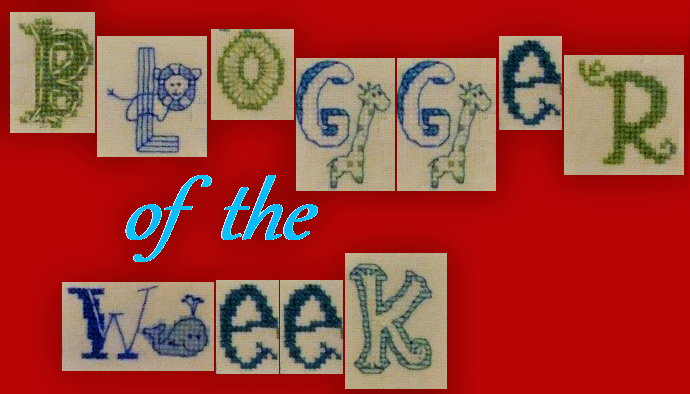 I want to thank you for this opportunity and appreciate the request to be a Blogger of the Week. I have never really "plugged" my blog and feel most people find out about it by accident. I had hoped to attract a bigger audience last year when I started the new year out by posting a different completed project every day--I called it Stasi's Stitch Stroll. It was quite time consuming but I really enjoyed the daily 'share" and got to make some new friends along the way. I ended the year with 440 projects shared!!! I couldn't believe I had actually stitched that much--it was a real eye opener! But it's what I love to do and I am blessed to be able to stitch to my hearts content in my retirement. So, if any of your readers are interested, feel free to visit my posts from last year and see my stitching legacy. I am adding to the Stroll as I complete new projects; I just don't post every day anymore. Please stop by and visit! Thanks again for this opportunity and for your "twisted threads" of friendship! Great answers. Thanks for sharing. Nice to meet you. I just love your cabinet full of stitching goodies. Beautiful! I enjoyed my first visit to your blog. I found it using the link in Jo's Serendipitous Stitching blog. I'm sure I will be back again to see more of your beautiful stitching. Howdy, nice to meet you~ Wow, your stitching cabinet looks like something out of a craft fair! How fabulous! I love the idea of the PVC stitching frame too. You are lucky to live near a place that hosts so many of your favorite designers. Stasi: Beautiful name, So happy to meet you and learn about you, beautiful designs you have stitched. Enjoyed getting to know you. Love the needle woman piece..so pretty. Hi Stasi, nice to meet you. 440 projects finished? That is impressive! No wonder you're outgrowing your cabinet. You have made some amazing things here!I will go on your blog to have a look too. Nice getting to know you.AriadnefromGreece! Nice to meet you Stasi. Your stitching is simply beautiful and I am so in love with your display cabinet! Great to meet you here, Stasi. And to see some of your finished pieces. That stitching cabinet looks like a real treasure trove to me and I'd like to sneak a look into it. But instead I will visit your blog and have a look at your stitching. Thanks to all who have commented; I appreciate it and hop to have you visit my blog when you gt a chance. Enjoy some stitching!!! Stasi, I was one of the fortunate that discovered your stroll and was thrilled to see a new post each day. I hope others go back to see all 440 pieces that you have stitched. Must have Sinned is AMAZING!!! You must have been thrilled when you put the last stitch in it. I think it's really sweet you completed as a child a piece your Mom started. I truly hope your grands develop a love for stitching too. So nice to read more about you.